Product categories of Silicone baking mat, we are specialized manufacturers from China, Silicone Baking Mat, Non Stick Silicone Baking Mat suppliers/factory, wholesale high-quality products of Food Grade Silicone Baking Mat R & D and manufacturing, we have the perfect after-sales service and technical support. Look forward to your cooperation! Packaging: Each piece per PE bag, then 200 pcs per carton. For large order, other package can be available. Packaging: Each piece per PE bag, then 100 pcs per carton. For large quantity, other packages can be available. Packaging: Each set per PE bag, then 12 sets per carton. For large quantity, other pakcages can be available. Non Stick Silicone Baking Mat is a commercial-grade baking sheet designed for home baker. 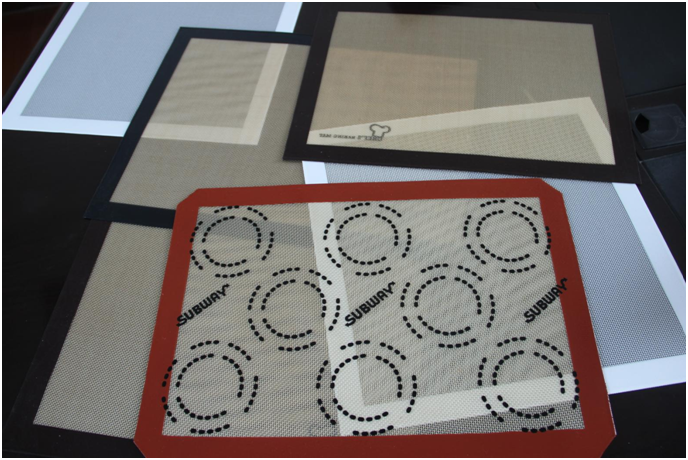 Baking mat works in standard and convection ovens. Perfect for baking jelly roll cakes, bread, pastries, cookies, and more. Made from FDA-approved, food-grade silicone and reinforced with Fiberglass Mesh fabric. Naturally non-stick so foods release quickly and easily without oiling or greasing for easy cleanup. Heat transfers evenly so foods brown perfectly. Outlasts thousands of bakes.